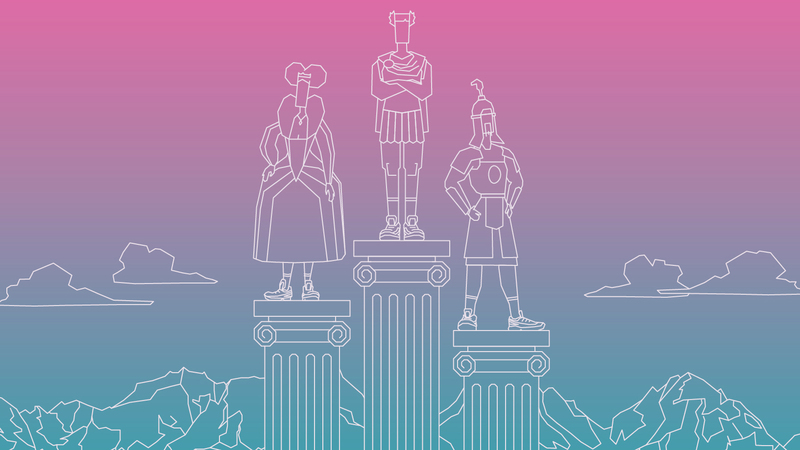 Now we’re in the final week of Kickstarter fundraising for Run An Empire, I thought it might be good to explain why we wanted to make the game in the first place. A bunch of ideas and observations sort of fell together into a basic “Run An Empire” shape over a year ago. 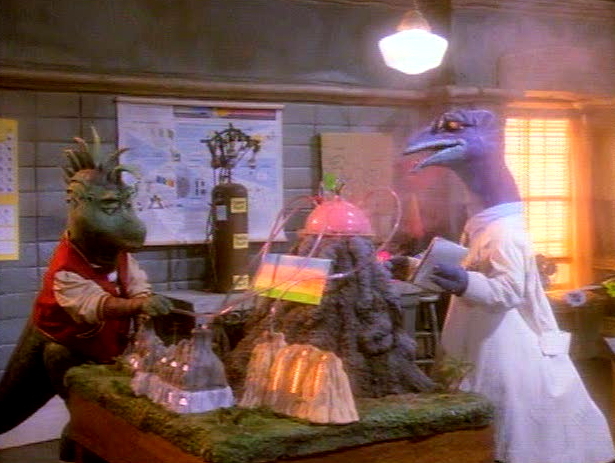 Probably the closest analogy I can conjure is from an episode of nineties muppet sitcom Dinosaurs. In episode 215 (Power Erupts) pubescent Hypsilophodon Robbie “Bart Simpson” Sinclair comes up with an idea for sustainable geothermal energy by combining different objects and systems around him – a jelly strainer(? ), a volcano and a foot pump. I don’t know if there’s an actual lateral thought methodology that exists to this effect, but it’s kind of what happened with us too. I’ll attempt to describe what elements were present in the genesis of Run An Empire, and what spurred us on to make it. The nub of the idea came about in late 2012, whilst developing initial ideas for the first Playable City Award. In the end we went on to develop Hello Lamp Post, but the theme of localised “ownership”, combined with play, came up several times. 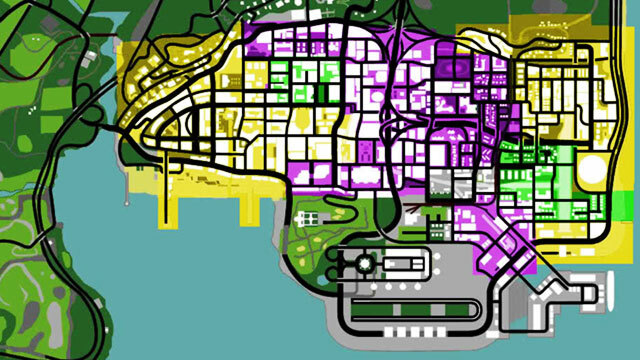 We were interested in Risk, Strava, Go, “The Dots Game”, Advance Wars, the gang-warfare tagging mini-game from GTA: San Andreas, and a bunch of other stuff. As our ideas progressed, smartphones and Apps didn’t feel like the best application for the brief, so we ended up going in a different direction. However, the spark of an idea was there, and the more we looked around at what already existed, the more we saw an opportunity to get people playing something unlike anything else out there. Each category contains a huge number of apps, of varying degrees of quality. Then there are some well-executed crossover products that benefit from the fusion of two or more categories, and these have often been well received. As we mentioned on the Kickstarter page, we intend to make a full-blown game, not a “gamified health app”. 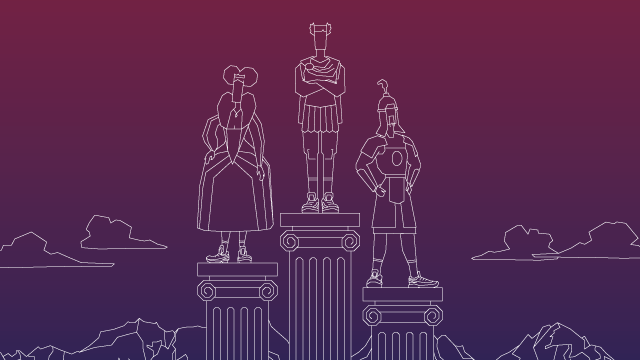 This is because we’re most interested in making something fun, but paradoxically a schism between points and energy exerted could (we believe) be a progressive device in future digital-physical activity games. It could liberate games-with-benefits from the “gamification” dogma, and allow for more creative and more entertaining play mechanics. Take football. Football is a game, played for fun. The objective is to score goals – not to “be healthy”. If someone were to take the components of football and “gamify” them to improve health then the end product would likely more closely resemble football training than the game itself, with slaloms and bleep tests and little plastic markers. Football doesn’t fundamentally demand constant activity, or a granularity of quantification beyond the main points system – a player might, through skill or luck, find themselves on a winning team, even if they haven’t run the furthest, had possession of the ball for the longest amount of time or burned the most calories. As another example (and at the risk of including the franchise in two sequential blog posts) I remember how Sid Meier’s Civilization series taught me a tonne amount about world history, science, politics and philosophy. Alpha Centauri taught me a lot about nascent and theoretical fields of science. In each case, though I’m sure the developers of the games knew there was an educational fringe element to their work, they didn’t develop the games with the primary intention of teaching players and they knew better than to market the games on these grounds too. Knowledge became a fantastic byproduct. 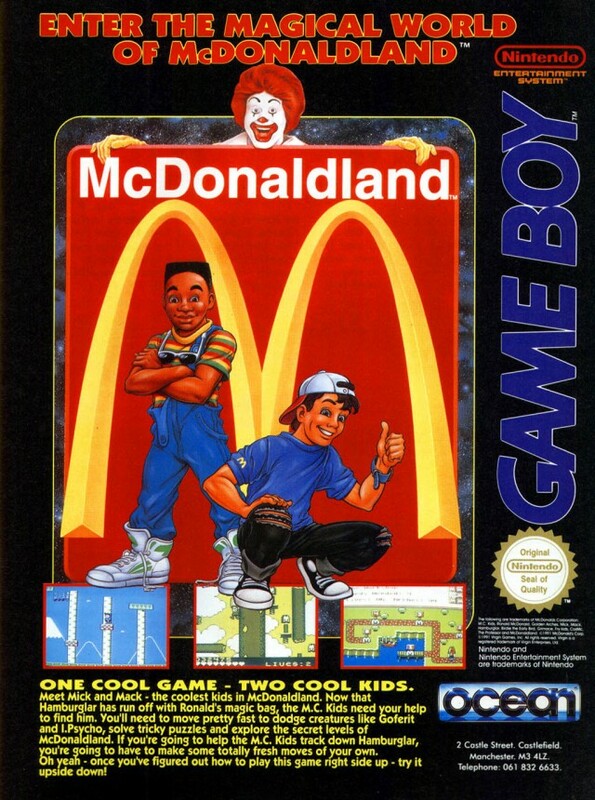 Compare this with the contrivance of typing tutorial games, which are led by the desire to increase typing skill (though Notch’s Drop is kind of fun), or the early corporate console games like McDonaldland or Cool Spot (or even the Chupa Chups-laden Zool) where the paper-thin façade completely undermined any gameplay value that might have existed. What do we have on our hands then, if it isn’t a gamefied health app? Is it, perhaps, a sport? Sport is kind of a funny term to define, but we could say it’s a subcategory of gaming, itself a sub-category of play. Sports are generally considered to be competitive, multi-player, and involving entertainment and skill. Depending on who you ask, sports can include car and horse racing, darts and billiards, poker, chess and even Starcraft – but generally speaking we consider then to involve physical action. Sports can be somewhat divisive too. Though the global market is worth a buhzillion pounds, in the US something like 60% of adults simply ‘don’t like sports’ at all (SIFA and ACTIVE Network, 2012). Though I can’t really speak for Ben – who likes his football and cricket – I would probably count myself as one of these folk. Like a lot of people, I suspect, I grew up enjoying the puzzles and immersion of tabletop and computer games, but couldn’t really get into competitive sports, which required a level of co-ordination and physical skill that I felt I lacked. It can be difficult to find social sports compelling when one finds themselves consistently in the lower 50% of ability and I imagine experiences from PE at school are what put many people off returning to these kinds of games later in life. Which is a shame, I would concede. Many sports possess an incredible culture, and playing them can tap a deep well of sensations and emotions – it’s a shame not to feel more involved with them. As an experience designer I’ve had a removed admiration – jealousy, even – for the ability of spectator games like Football and Rugby to draw such intense emotional responses from their spectators – an energy you couldn’t ever hope to replicate in a cinema, theatre or installation space (though Alex Fleetwood told me they got a certain amount of frenzy out of people at the Hide & Seek Sandpits). Run An Empire feels to me like an attempt to reconcile myself with the intentions behind “sport” (application of skill, social mediation, play) – and make them applicable again on my own terms. I’m hoping it can have a similar effect for others. The proliferation of smartphones and the cultural groundwork laid by alternative-reality gaming has given us the opportunity to seriously pursue this. There’s an under-exploited potential, technologically, for us to take part in entirely new forms of localised, physical, asynchronous, competitive play. Games like Ingress and Zombies, Run!, and applications like Foursquare and Runkeeper have definitely exposed some innate appeal here. Maybe the next step is an entirely new typology of physical play – a kind of augmented “Frankensport” (or New Sport) – something with a unique applicability and purpose. Perhaps we could even see a return to mass-subscribed community sports – like the epic mob football games of medieval Britain, which would have neighbouring towns competing in a single game. Our aspiration, ultimately, is to see Run An Empire create benefits in several ways. We want to see it entertain, change the way we think about the environment around them, encourage a new typology of play and, yes, improve people’s health. 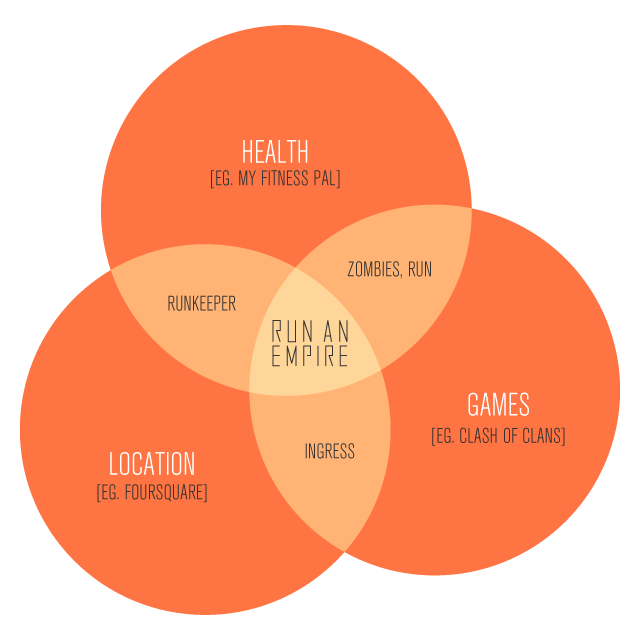 Though not designed with healthy living in mind, we know that Run An Empire has the potential to encourage regular exercise and we’re excited by the idea that the game can also be used this way. We want to see a never-ending game, played simultaneously by many people of varying levels of fitness, on a playing field that encompasses the whole world.